For 2018, Mollificio Valli s.r.l. 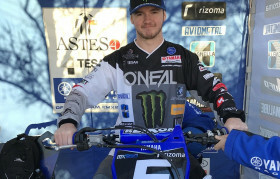 is the official sponsor of Team EMX250 Yamaha Racing. The 2017 is over from few days and our Team is ready to face the new races of the 2018 season. 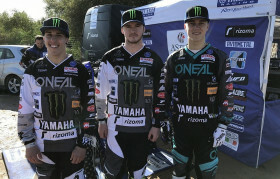 New year and also new riders for our Team, in fact, only with the exception of the reconfirmed Roan Van De Moosdijk #39, we were on the track of Riola Sardo for the first round of the Internazionali d’Italia with two new entries the Italian Nicholas Lapucci #211 and the US rider Tristan Charboneau #5. Riola Sardo is now one of the classic races that precede the World Championship and, as usual, sees the participation of many riders of the World circus who use this race to test the conditions of riders and motorcycles. Very useful race for our boys, in fact we could verify the good physical condition of Roan on this sandy track that, in the race reserved to the MX2 class, ended with an excellent sixth place while in the final Elite ended seventeenth; physical condition on which we have to work instead for Tristan Charboneau who, starting from the top positions, has maintained in the first three places for some laps, only to finish in sixteenth position due to a physical decline. Nothing could do Nicholas Lapucci that, after a start in the first positions and some laps in the top five, he fell losing time and was unable to return to the race. Regardless of the results, Riola, as usual, is an excellent test that puts at the limit both the bikes and the riders, highlighting the points on which we have to work. After this race the team returns home to be ready then for the last race of Internazionali d’Italia scheduled in Mantova on the 18th of February.